If you follow me in twitter, U’d know I’d bought 2 kgs of cherries for just RM50. Really. I’m not kidding! It’s probably the best bargain u’d find here in Klang Valley. 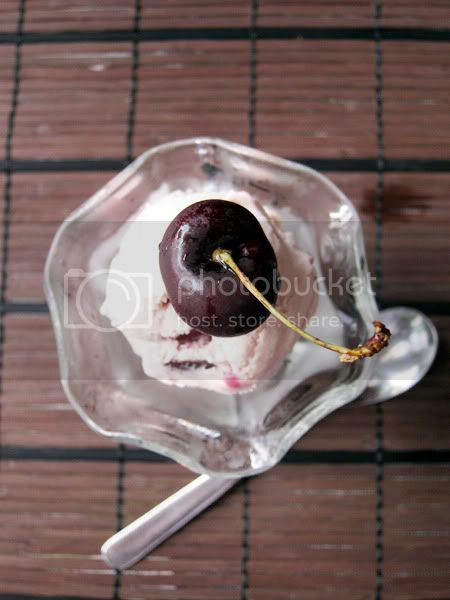 Fresh cherries are so yum.. I’ve got more cherries post coming. Clafoutis and Pie. hehe However this ice cream is more like sherbet. With water in the recipe, it’s a less heavy. And with alcohol in it, it doesn’t freeze as well. It kinda melts faster too because rum was added in it. Pit cherries, cut them in quarters and put in a bowl. In a saucepan, bring water and 50g of sugar to boil. Add in cherries and let it boil for 5 minutes. Set aside, let it cool. In a bowl, add egg yolks, and 1/2 amount of milk. Whisk to combine. In a saucepan, add cream and remaining milk, and sugar. Scrap vanilla beans into pot. Bring to simmer, lightly whisk into egg mixture. Pour mixture back into the saucepan and whisk constantly over low heat for 4-5 minutes or until mixture thickens. Strain into another bowl. Stir in rum and discard vanilla pod, or let it dry and make vanilla sugar with it. 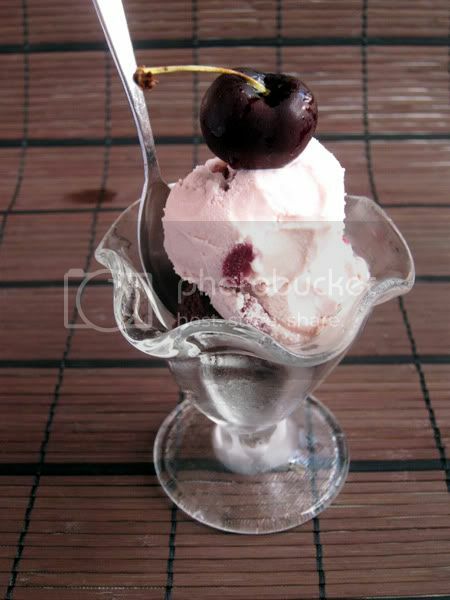 Combine both cherry and egg mixture. Let it cool and make ice cream in the maker according to manufacturer’s instructions. It took about 60 minutes in my Cuisinart Ice Cream Maker as it was about 1.1 L.
Once done, freeze in the freezer for a couple more hours so it sets fully. Swee San, the cherries you bot was so cheap, even cheaper than in Spore. Did you inform Wendy about it? I am sure she wil grab many kilos. 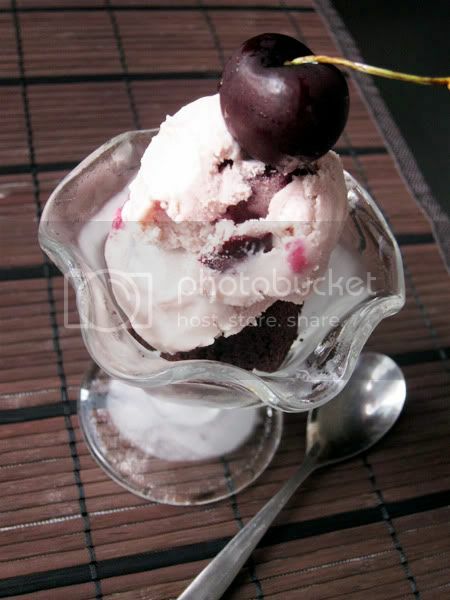 For such hot weather in Spore, I will definately eat one scope or more of this ice-cream, looks so yummy. Yes Jess, I told her.. but I bought at the pasarmalam outside my house. and it’s the last 2 kgs. But otherwise its RM30/kg which is still cheap anyway. I hope they have more this week..
Wah, yours look good and nicely pink. I’ve seen some that are brown. Yo which fruit stall is that? Where is that pasar malam?!? I’ve been salivating over them cherries but it’s SOOO expensive in supermarkets. Sob. Tuesday pasar malam in Telok Pulai.. Not sure if they have it every week..
REally … omg !! which year r u from ? ok, I’m gonna get my aunt to scout them out for me. Bing cherries, right? Same year as you. You were in the Orkid class, right? I was in the Rose class. When I was first teaching Kenneth, I was thinking why that fella looked so familiar. And 1/2 a year down the road, he brought in some mooncakes (I think) and said his sis made them. I was chatting with the class, told them where I studied and then out it came. He said his sis is Swee San. Then it all made sense. You people look alike! haha… Weird how all the connections come together. ya.. orchid.. oh gosh.. How small the world is lol.. So u’re now still teaching in Pin Hwa ? haha that’s so cool..
I’m no longer teaching there. Left to further my studies and now working for my inlaws. 🙂 I’ll be visiting this space often from now. Like you, I have a passion for my kithen, though less professional than you. Keep up the great work! Say hi to Kenneth for me. Thanks. Can I succeed after Tracie to be your partner-in-crime ar? Never get to try your ice cream! I suppose lighter ice cream is better on our waistline … Hahaha!